A heated debate ensues whether to have HTTP or HTTPs on your websites. If you want to ensure a flawless user experience on your website, you should have a secure third-party encryption. As customers are getting more and more tech savvy, security is also becoming one of the most important parameters to consider. While website owners were still pondering over the dilemma of HTTPs versus HTTP, Google announced that HTTPs is a must for better website ranking. That declaration mandated the employment of HTTPs and SSL Certificates on every website. The green padlock that comes with HTTPS depicts that the website is secure and all the transactions carried out through the payment gateway are safe. It is natural that your customers would be paranoid about buying from you or doing business with you if your website is not secure. To help them get over this apprehension, HTTPS is important. Hypertext Transfer Protocol (HTTP) allows you to exchange information on the Internet. It is referred to as ‘application layer protocol’, which means that it takes into consideration the way in which the recipient sees the information rather than the way in which it is transferred between two points. HTTP helps in accessing HTML pages. Also, by accessing HTTP, many other resources may be used. In the past, HTTP was widely used in websites that did not ask for any personal details such as credit card number, bank account number, etc. from the users. Security was not considered important for these websites so it was not a problem for them. On the other hand, HTTPs prevents the access of information by unauthorized sources. HTTPs and HTTP abide by similar protocols but HTTPs uses SSL to protect the data and offers better security to the users. Long story short, HTTPs is the secure counterpart of HTTP. SSL and HTTPs are used synonymously but that is not right. HTTPS uses SSL to transfer the information and a combination of the two ensures website security. Let’s delve deeper into how HTTPs impacts your website and renders a favorable user experience with regards to search engine ranking. Google gives more preference to websites with SSL Certificate. As a result, there is a boost in the search engine ranking of the site. 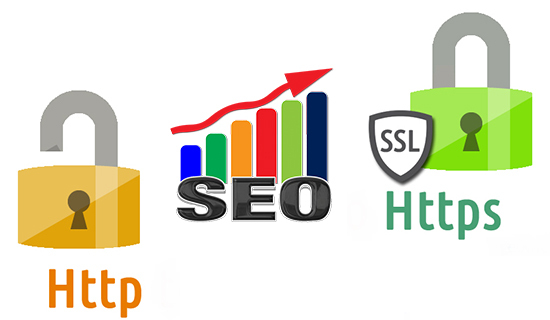 There are several ranking factors to be considered for SEO and while SSL is not the only factor contributing to it, it certainly is a crucial parameter to consider. You can get access to referral data from HTTPs websites whereas HTTP websites do not preserve this information, thereby misinterpreting the website visit as direct rather than referred. HTTPs helps in meeting the search engine optimization goals by verifying the website and not allowing third parties or suspicious elements to access the information. Moreover, it encrypts every URL and maintains the confidentiality of credit card numbers and history of pages visited. As Google recommends HTTPs, it is obviously true that it is going to be beneficial for your website and drive business growth in the long run. Just make sure you follow the tips enlisted below so that your visitors do not face a major setback while you switch to HTTPs. The first step that you should take is to inform Google that you have switched the website from HTTP to HTTPs. Use only 2048-bit key certificates. Determine whether you need a single or multi-domain certificate. You can also consider buying a wildcard SSL Certificate. You should use relative URLs for resources on a single secure domain. Make sure that the HTTPs website gets crawled. Let Google and other search engines index the pages of the website as far as possible. Do not use the noindex meta tag in robots.txt. Select protocol relative URLs for remaining domains. Be wary of how HTTP is migrated to HTTPs with the help of analytics software and Webmaster Tools by Google. SSL Certificate principally means a code block on the website server to ensure secure online communication. SSL Certificates help in activating an encrypted connection at the time the browser connects with the secure website. It is a lot similar to sealing a confidential package sent at another destination so that the consignment reaches the recipient safely. SSL does the same. When a website owner requests an SSL Certificate, the information of the company gets verified by CA and then a SSLcertificate is issued to the applicant through an authentication process. Google’s Qualys Lab Tool can be used to test the security level of an HTTPs website and determine whether it is working appropriately. if you have an ecommerce store or websites that mandate the use of sensitive information from the user, you can buy cheap SSL Certificate available online from SSL2BUY. You have absolutely nothing to lose if you switch to HTTPs, but your brand reputation and customer trust is surely at stake if you do not make the switch. Get rid of the apprehension and overcome the dilemma before it gets too late and move to HTTPs right away. Note that your customers will be keener on buying from you if they are confident about your credibility… And HTTPs imparts this confidence to your prospects as well as customers. It is one of the major reasons your customers will continue to buy from you and be loyal buyers. After all, customer retention is far easier than customer acquisition. The good news is a secure website experience will help you with both.